Covering up political failings, Gov. 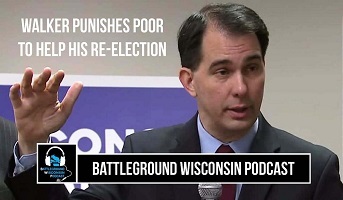 Walker chose to divide us this week by scapegoating the poor. And, a new report reveals $1.6 billion of the Foxconn state payout won’t be tied to job creation. STATEWIDE - Gov. Walker rightly understands that he and Republicans are in serious political danger heading into his 2018 campaign. In an attempt to cover up political failings, Walker called a special session this week to further punish the working poor and struggling families in Wisconsin. Instead of calling a special session to address the shortage of family-supporting jobs in most parts of the state, Walker chose to divide us by scapegoating the poor. Next, we discuss a new report revealing that $1.6 billion of the Foxconn state payout won’t be tied to job creation and that 39% of the water Foxconn takes from Lake Michigan won’t be returned to the lake. Finally, we discuss the news that the state’s school choice program now has nearly 400 private schools registered for 2018-19.